An unrivaled talks & lectures program for visitors & artists feature the most established and respected voices in contemporary art and culture of international artists and academic. During the exhibit days the curator will award with Lifetime Achievement Award to Grimanesa Amoros|Usa; Polyxene Kasda|Greece; Sauro Cavallini|Italy; Rien Vorgers|The Netherlands. Grimanesa Amorós, American, born in Lima Peru, she lives in New York City. 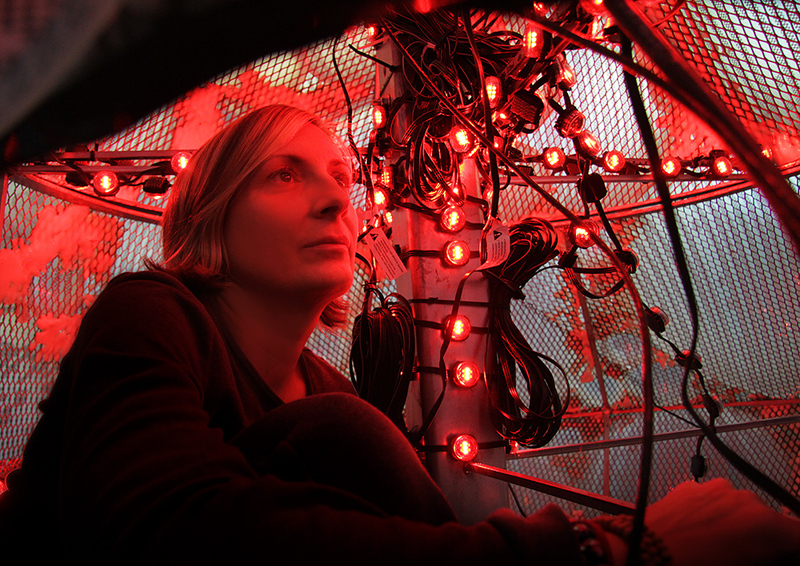 She is an interdisciplinary light sculpture artist with diverse interests in the fields of social history, scientific research and critical theory. She makes use of sculpture, video, and light to create works that illuminate our notions of personal identity and community. She is TEDGlobal 2014 guest speaker, a recipient of NEA Visual Artist Fellowship, NEA Artist Travel Grant, Art In Embassies Program of the U.S. Grimanesa Amorós has often drawn upon important Peruvian cultural legacies for inspiration for her large-scale light installations. She often gives talks at museums and universities where her lectures not only attract future artists but students and faculty engaged with art, science and technology. Amorós, a lighting sculpture artist, has exhibited in the United States, Europe, Asia and Latin America. Polyxene Kasda, was born in Alexandria, Egypt, she lives and works in Athens, Greece. She is an interdisciplinary artist, writer & research artist with diverse interests in the fields of poetry, myth, network, scientific research and critical theory. She taked part in numerous exhibition over the world and her works are in public collection and she often gives talks at museums and universities. 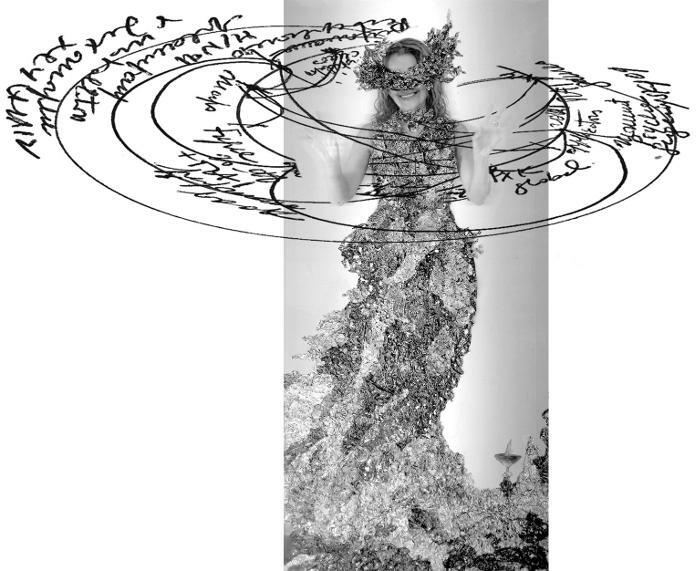 Her main Project Myth/Network 1990-2016, is a long-now work, characterized by depth psychology, experiments on space/time transpositions and on the linguistic scaffold of perception. ‘The Conscious Eye’, of Poly Kasda (Artificial Intelligence Prof. John Kontos “Needles” Poly Kasda’s Conscious Eye. Perception-Consciousness-Diegesis-Discovery-Creativity) is associated with the epistemological interpretation of under-determination. Poly Kasda initiates a genuine and systematic exploration of the human experience and the cognitive processes that transpire the works of artists and the artistic movements of the 20th century. The human eye is used as an interface, the eye becomes a quasi-mechanical component tool which creates a tube between the inner and outer reality topology. 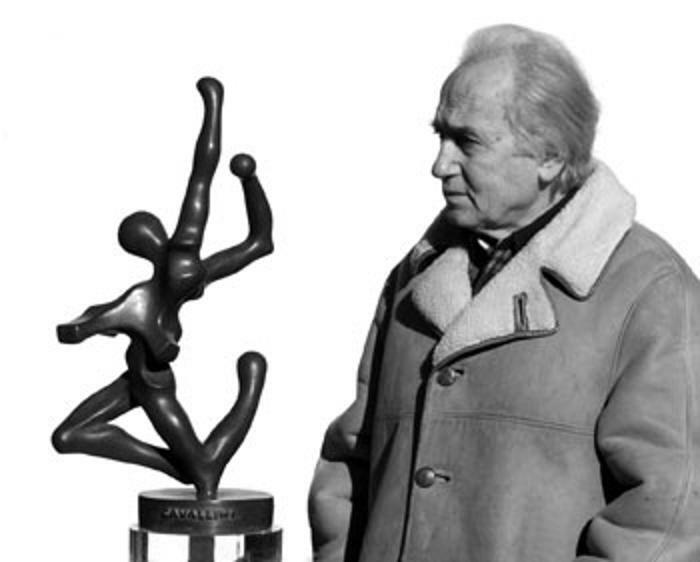 Sauro Cavallini was born in 1927 in La Spezia (Italy). He lived in Fiesole (Florence-Italy) where he died in 2016. He is one of the most important artists in the field of sculpture. His works (including large-scale monuments) are owned of important public and private collections including: Palace of Government in Bonn (Germany), Rai Italian National Television in Florence (Italy) , San Miniato Church in Florence (Italy), Business Palace in Florence (Italy), Palace of Human Rights in Strasburg (France) , Principality of Monaco with vernissage by princes Ranieri III , his son Alberto and Francesco Cossiga (ex Italian president), and many Italian banks. On October 2017 his son Teo (as heir), he will receive in Florence (Italy) the medal award to the career “Lorenzo il Magnifico” on his father’s memory during the XI Florence Biennial of International Contemporary Art. 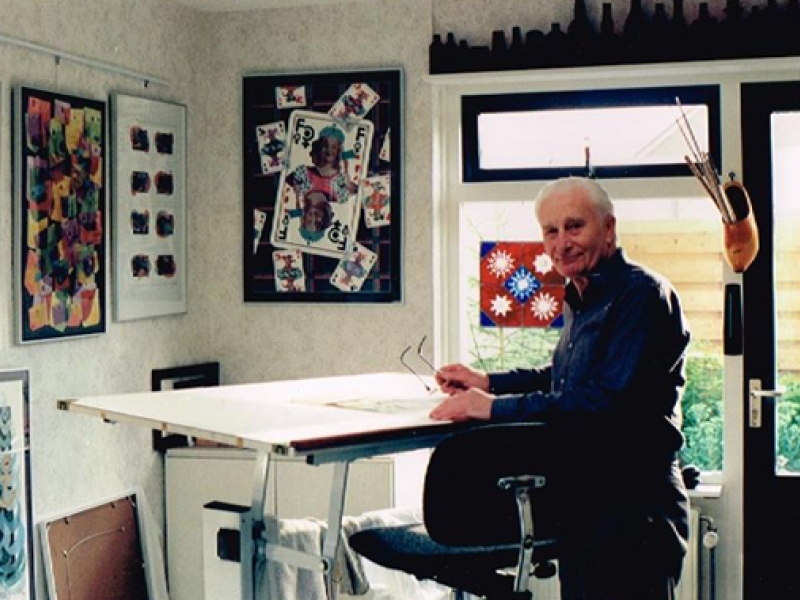 Rien Vörgers was born in Enschede, The Netherlands, in 1923 and he died in 2013. Between 1945-49, he travelled through Southeast Asia with his own Netherlands Indonesian Welfare Artists theater and cabaret company. It was only in the early 1980s, that he realised full-time painting , when he had first created his own renovating “mosaic” style, which goes one step further than Mondriaan’s work half a century earlier. His meditative way of creating resembles that of De Kooning, who also dared to deviate from the current fashion in abstract painting. And though Picabia was the first modern painter using “transparency”, he did not get rid of lines and contours like Rien does. In the Dutch Government’s Parliament building “Het Binnenhof” in The Hague, a seven months solo exhibition was organised in 2002/3 especially for 24 of Rien’s paintings, where the Vice Prime Minister and Secretary of the Treasury then in function, Gerrit Zalm, opened the show officially, on september 3, 2002. In 2005 he was awarded in Florence (Italy) with the medal award to the career”Lorenzo il Magnifico” during the V Biennal of International Contemporary Art. In 2009 he was awarded of Certificate of Excellence (Honorable Award) by the Artaddiction Galery in London. Committed to fostering contemporary art criticism and discourse, VISIONARY ART SHOW will publish on the blog THE DISCOVER ART JOURNAL online Italian journal of contemporary art.